Family and friends can relive a special memory every day when you present them with this useful Picture Perfect Photo Tin Keepsake. 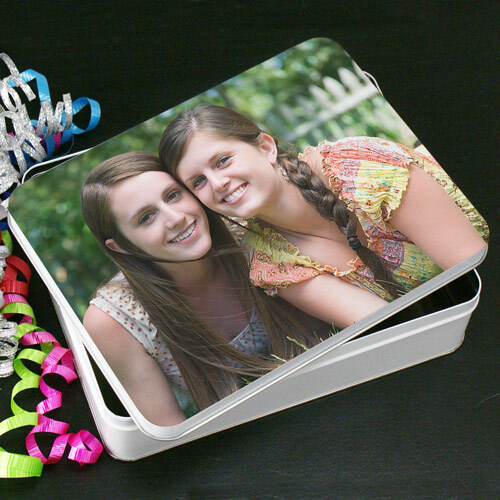 Our Photo Tin is great for storing all your precious memories and more. Also makes an ideal gift for weddings and an anniversary keepsake. You may also like to store your Picture Perfect Puzzle Pieces in this Photo Tin to make it a truly unique gift idea. Each Metal Tin measures 6" x 8" and makes a great gift idea for anyone on your shopping list. Our Personalized Tins include FREE Personalization of your favorite photo. Upload your digital photo below. Please dont send any photos in the mail, digital photos only. Tin measures 6” x 8"
This tin is so nice. I ordered it to go with a puzzle I had ordered for my grandson. Additional Details This Picture Perfect Photo Keepsake Tin is an excellent addition to our Picture Perfect Photo Jigsaw Puzzle. It's also great for keeping your precious keepsakes and favorite photo memories in one safe place. Create a fun and unique gift idea for someone special in your life today, with our great photo tins. This Keepsake Tin also makes a great Personalized Mother's Day Gift Idea. Be sure to also take a peek at our Picture Perfect Photo Placemat as well.